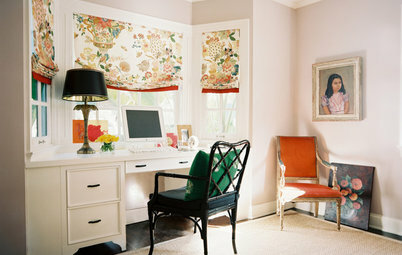 Many of us do not have an entire room to devote to a home office. 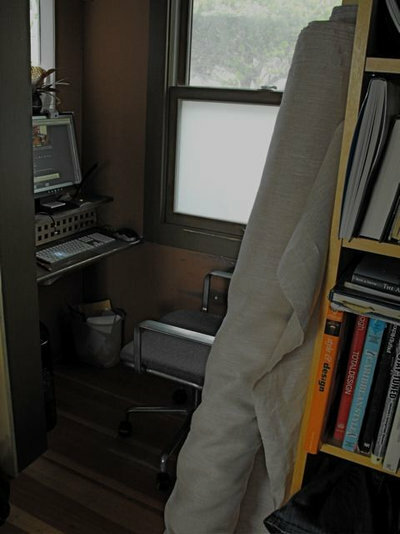 A lot of us barely have a closet-size space for a desk and chair. 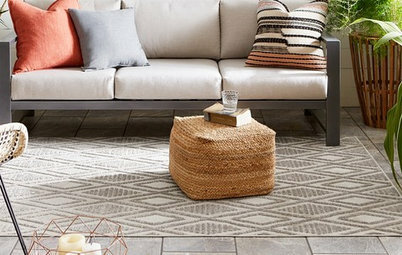 Even if you have just a guest closet, kitchen pantry or nook off the living room to work with, you can make that space work very hard for you. The best thing about turning a closet into an office, or “cloffice,” is that when you don’t feel like thinking about work, you can just shut the your doors and hide it from view. 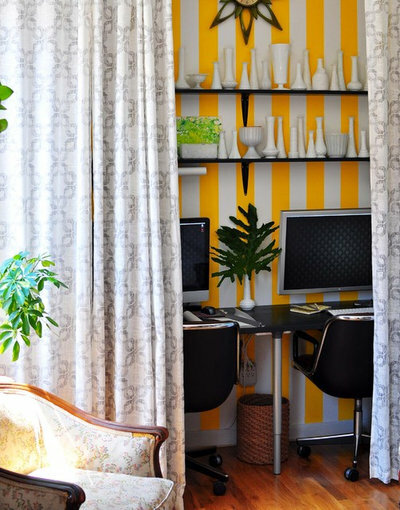 Here’s some small-office design inspiration, and tips to help you get started. 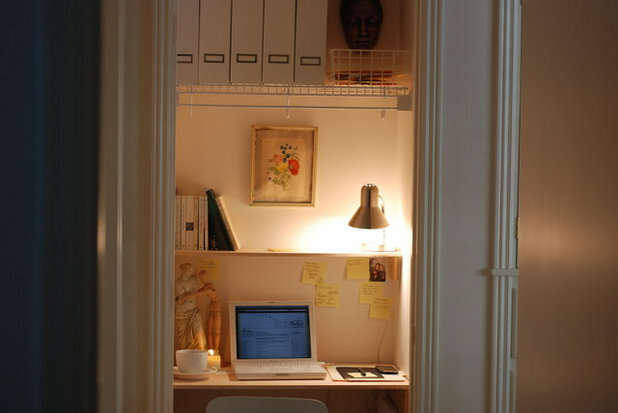 Have your own great office-in-a-closet? Post a photo in the comments section! 1. 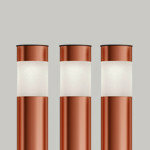 Measure depth. 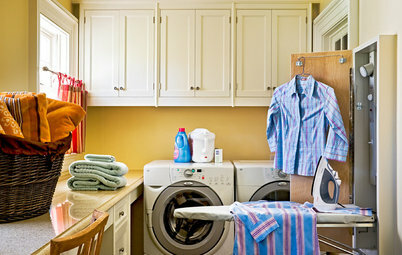 Make sure your closet is deep enough to handle this task. 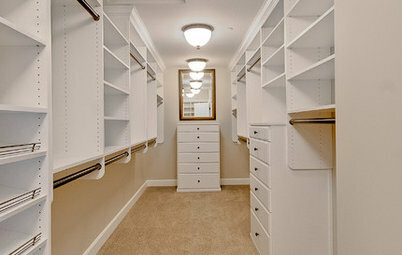 Lots of closets are only slightly deeper than the width of a hanger. 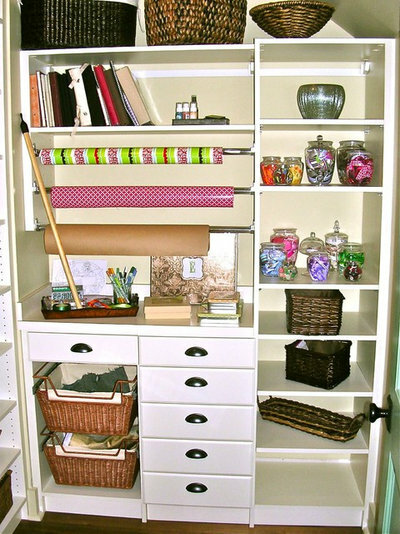 Take your binders, printer and scanner and place them on the closet floor and shut the door to make sure the shelves you install will accommodate them. (Remember you can orient your printer and scanner sideways if necessary). 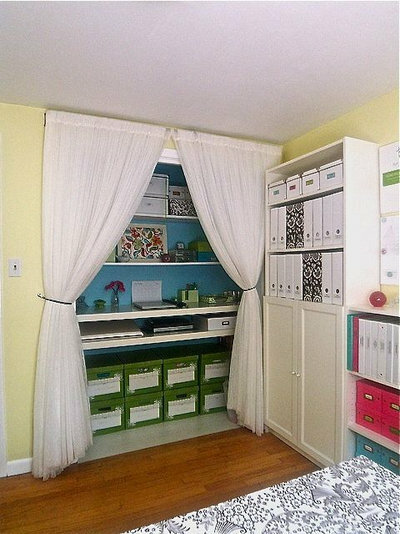 Also, figure out if your space is large enough to accommodate file cabinets; if so, make sure you install the desktop high enough so that you can slide them underneath. 2. Get the hook-up. Figure out what you need to plug in and have an electrician come over to provide the proper plugs for lighting and electronic equipment. 3. Separate. 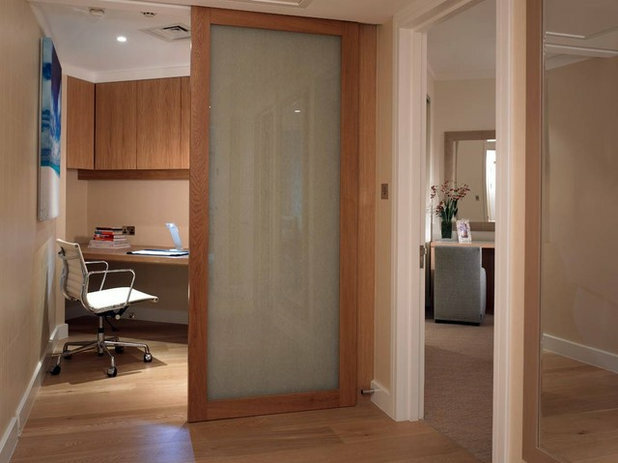 If you don’t have an existing closet that will work, consider adding a screen or installing a room divider to create a separate office area within a larger room. 4. Measure again – this time for height. 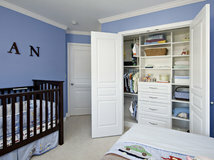 This time, determine the height you'll need for your tallest books and binders and add shelves accordingly. 5. 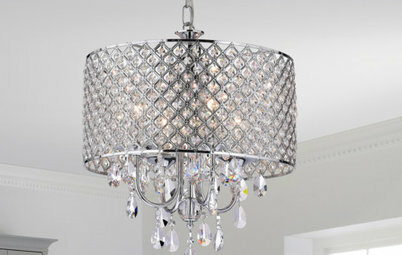 Jazz the space up as you would any other room. 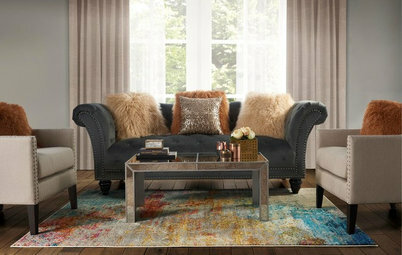 Make the area feel special by using wallpaper or a fun color on the walls. 6. Plan to keep the desktop clear. Who needs drawers? Check out the system this person has installed to keep items like scissors and pens off the desktop. 7. Consider an L-shape. 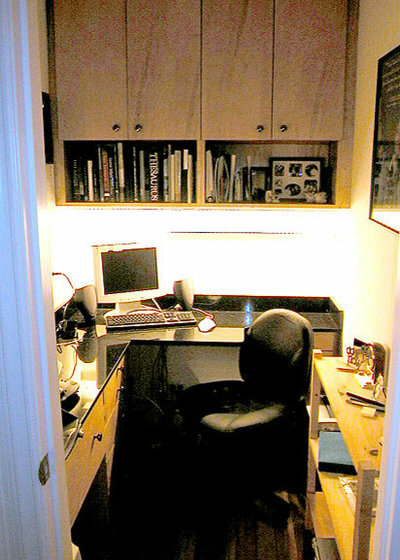 This person sacrificed a walk-in closet to be able to have some scooting room in the office. 8. 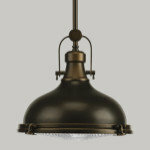 Let there be natural light. If you are really going to be spending a lot of time in your walk-in, see if installing a skylight or window in the space is a viable option. 9. Pick a chair. 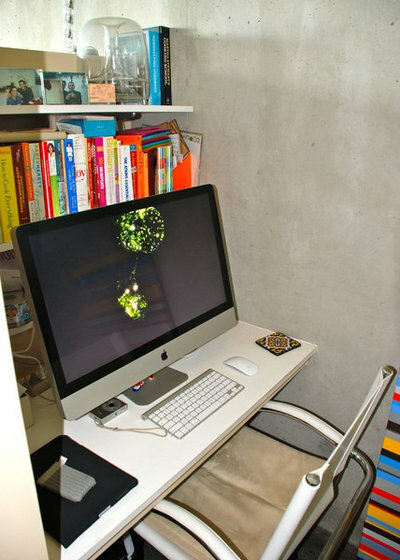 An armless chair is more likely to scoot right under the desktop and allow the doors to close. 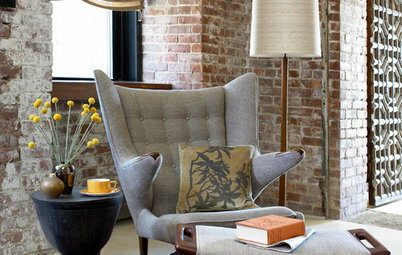 You may also choose to make an occasional chair in the room work double duty and simply pull it over to the closet when you need to get some work done. 10. Use closet technology. 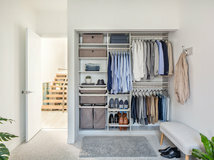 Here closet designer Lisa Adams designed a cabinet system right outside of singer/songwriter Jewel's closet where she can relax, take care of business and yodel. 11. 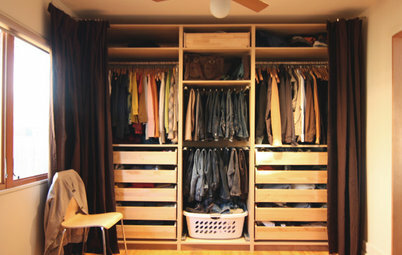 Save space by eliminating the closet doors. Perhaps you’ve got pesky doors on tracks or you don’t have the room for regular hinged doors to swing open. Here simple curtains contain a craft space. 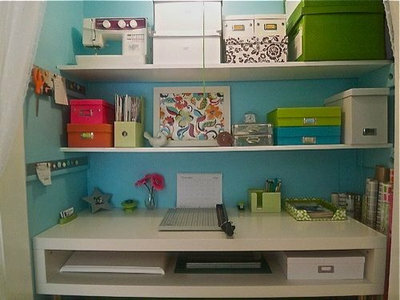 I have to show you the details fo the closet craft space shown above. 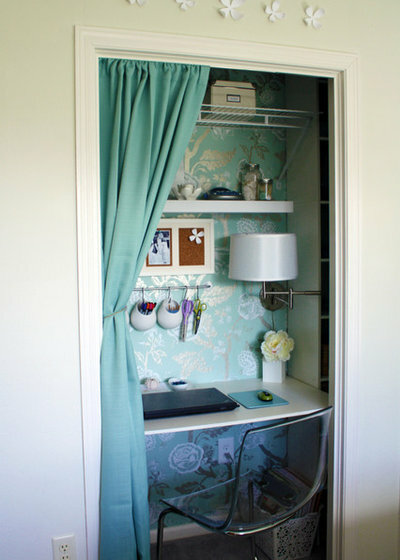 Take notes on this turquoise back wall. It enlivens this area and designates it as something special. 12. Sacrifice a closet for your passion. 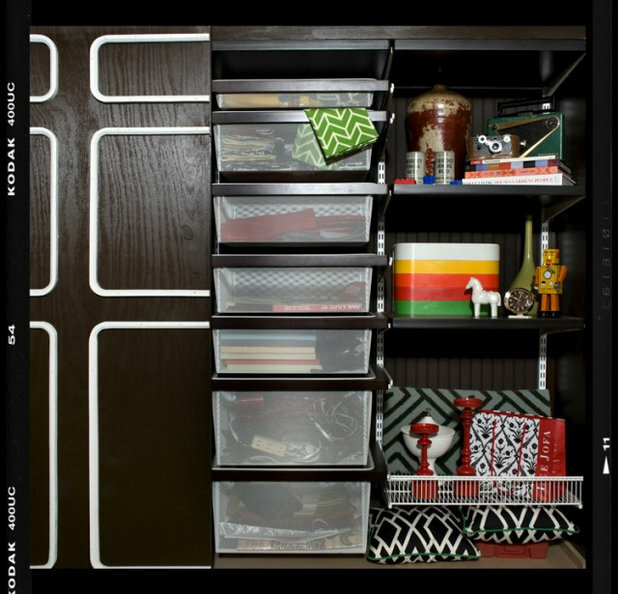 This is not technically an office, but this closet is devoted to keeping fabric samples, craft supplies and wrapping paper organized. 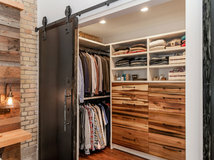 Here's another shot of the previous closet. 13. Make sure you have enough shelf support. Learn from me: I decided to put the shelf brackets toward the outermost beams for aesthetic purposes, and now my cheap shelves from the big box store are starting to bow. 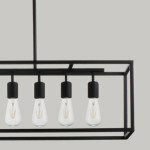 While aesthetics are important, function is more important. 14. Do inventory before you choose your system. 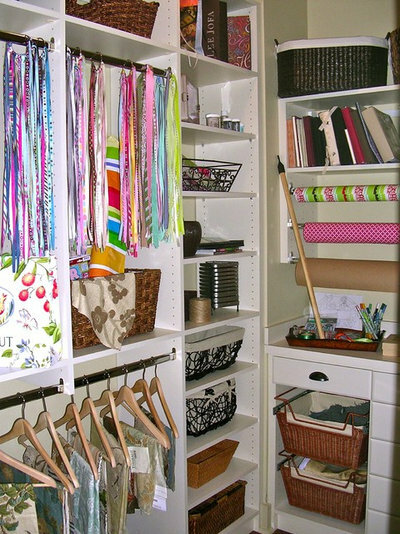 Figure out everything you'd like to fit into your closet office, then bring your measurements and your needs to the experts. In this case, an associate at The Container Store helped The Decor Demon figure out the best way to store everything with an Elfa system. Make the most out of store associates; there are very knowledgeable people available at stores that are there to help you no matter how big or small your budget is. 15. Don't have a closet? Don't lose hope! 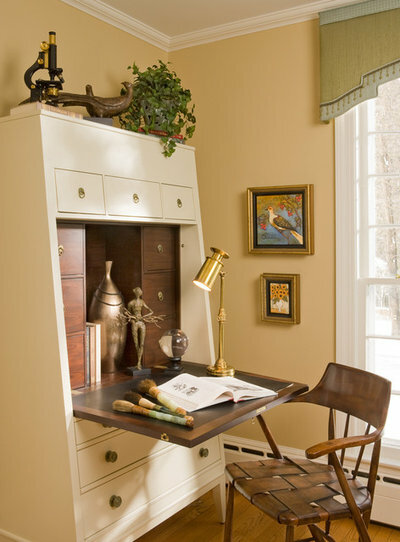 Armoires and secretary desks can add small work spaces at home and house most of your home office necessities. 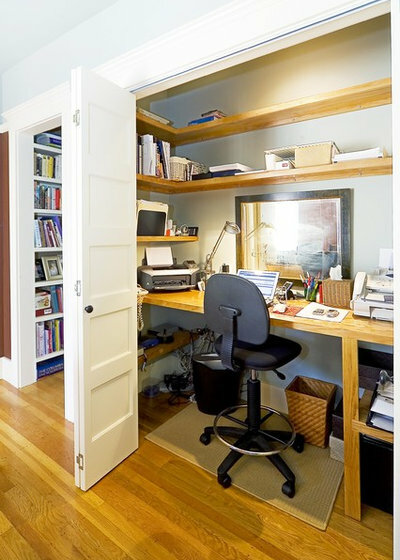 Let's take a look at how Houzz users are making do with closet-like home office spaces. Lucas Mire has a tiny closet-like space at the end of his kitchen. 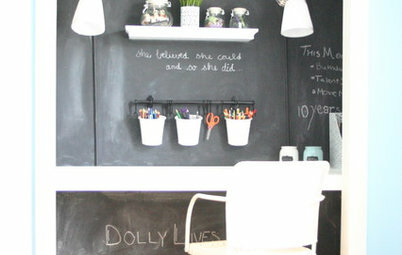 "In a small space living, the home office needs to be compact but mighty. In that regard, my little office nook packs quite an efficient punch. Its proximity at the end of the kitchen makes it accessible, yet semi-private. A few shelves give me the perfect spot for my cookbook collection, thank you notes, filing, my iMac, and music. 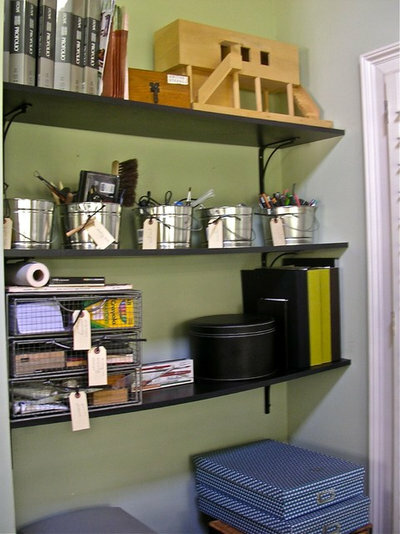 Plus, if I have any impromptu visitors and have some lingering kitchen counter clutter, I can pile it into a neat stack and put it on the desktop on the other side of the cubby wall, out of sight. 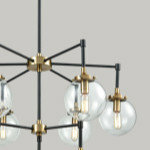 It's the ultimate multitasker, and in a small home, that's a definite winner." 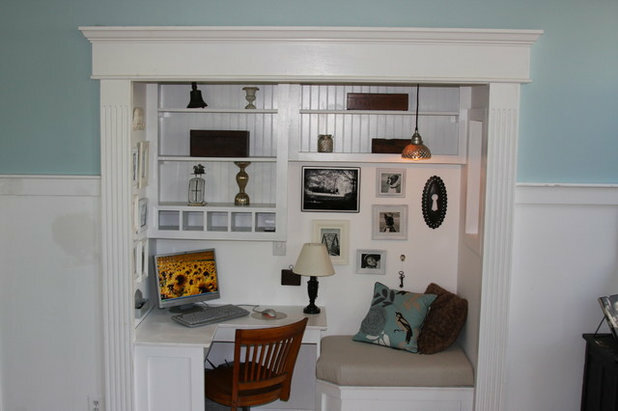 Houzz member Tricia Rose has found a compact corner with a view for working on administrative work. "Compact is a kindly way of describing my office," she says. "It used to be the entrance porch and is a tidy 30"x70". I shoehorned a tall Ikea chest in one side for papers and books, and my computer desk is on the other, high level shelves both sides, and me in the middle on my vintage Hille Supporto chair... It gives me a defensible space for administrative tasks but I'm always juggling notebooks and envelopes. "On the other hand," she says, "I can lean back and wedge my chair in the corner, with my feet up on the doorframe and talk on the phone in perfect comfort, just like Gordon Gecko. The other thing I like is that I don't have my back to the room — hate people creeping up on me."